Carolyn Meyer's series The Young Royals has examined the youth of many of history's most prominent royal female figures, including Queen Elizabeth I, Marie Antoinette, and Cleopatra. It's perhaps inevitable that she would turn her attention to the most important female queen of the 19th century, a figure so prominent she gave her name to an entire historical period, Queen Victoria. The book spans from 1827, when Victoria was eight years old, to 1843, by which time Victoria was a young queen with three children. Meyer tells her story through diary entries based on Victoria's own diaries, which she began keeping at the age of thirteen. (Note: in 2012, the entire contents of these diaries were made available online). T As Meyer explains in an afterword, these diary entries were written in the knowledge that they would be read, at first by her mother and governess, and later by historians. Meyer uses her imagination (and research of course) to describe what Victoria is really feeling, but incorporates many of Victoria's stylistic quirks, such as an affection for writing in all capitals or underlining dramatically, to give the feel of her actual diaries. I really enjoyed this novel, and felt it did a terrific job of capturing Victoria's strong personality and opinions, both as a young girl and as an adult. We learn many details of Victoria's daily life, from her strained relationship with her mother and her advisor, Sir John, to her attachment to Dash, her mother's King Charles Spaniel. Even when you're a privileged princess, you don't necessarily get your way, and Victoria's wishes are often thwarted by her mother or court intrigue. Even when she becomes queen, her struggles with her mother are not over, although Victoria takes control of many aspects of her court, including her personal household. In addition to dealing with all the intrigues of court life, Meyer also takes us into Victoria's confidence as she is wooed by and eventually weds her cousin Albert, the love of her life. Even with Albert, however, there were inevitable conflicts, as the young couple tried to adjust to their different roles--queen, sovereign, wife, and mother, and prince consort, husband, and father. 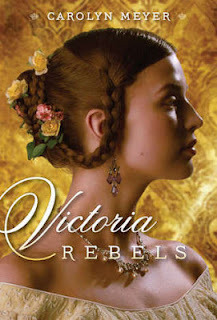 An afterword provides additional information on the rest of Victoria's life and other historical notes, as well as a bibliography and a list of related websites to visit. Those who read this novel should certainly get a copy of the DVD of The Young Victoria, the beautifully realized 2009 film starring an elegant Emily Blunt as the young monarch. Another appealing novel for young readers with the young Victoria as a prominent character is Prisoners in the Palace by Michaela Maccoll (Chronicle, 2010). Disclosure: advance copy provided by publisher. Thank you, Margo. I love it when my books connect with readers--and librarians.